The Orthodox Church is often described as “America’s best kept secret”. There are many Americans who don’t even know the Orthodox Church exists, and are often taught that a heresy is the true Christian faith. This is a story that shows us how this can change. At the collapse of the Roman empire, Germanic tribes began to assault Hispania (modern day Spain and Portugal). This eventually led to the Visigoths conquering the majority of the Iberian peninsula. This was devastating to the Orthodox natives as the Visigoth rulers were strict Arians. The difference between these two classes led to the persecution of the Orthodox and instances of rebellion against the Visigothic rulers. The link between the Byzantine empire and the Orthodox in the Iberian peninsula did not help their status in the eyes of their Arian rulers. In 568, King Liuvigild came to power in the region, he was in a perpetual state of war with the Byzantine empire. King Liuvigild had two sons, Hermenegild and Reccared, whom he placed in powerful positions in hopes that they would succeed him. In 579, Hermenegild married Ingunthis, a Frank of the Orthodox faith. Ingunthis became the first Orthodox Visigoth Queen. It seemed as if, as the elder son, Hermenegild was on the fast track to become his father’s successor as Visigoth king. This would not be the case due to the influence of Queen Ingunthis and the bishop of Seville. Leander of Seville was a native of Iberia and an Orthodox monk from a Christian family. Around the same time that Hermenegild would marry Ingunthis, Leander was elevated to the episcopate. As bishop of Seville, Leander had ample opportunity to converse with Queen Ingunthis. It was the influence of Queen Ingunthis and the evangelistic efforts of Bishop Leander that would cause Hermenegild to repent of the Arian heresy and convert to Orthodoxy. Hermenegild went on to lead a revolt against his father. The revolt was unsuccessful and Hermenegild was eventually imprisoned. Leander was sent into exile and fled to Byzantium, where he befriended Gregory the Dialogos. 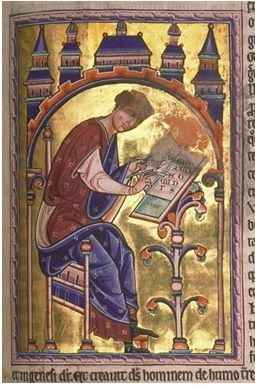 Gregory writes that King Liuvigild sent an Arian bishop to commune Hermenegild while he was in prison, but Hermenegild refused. This enraged his father who then ordered him executed. 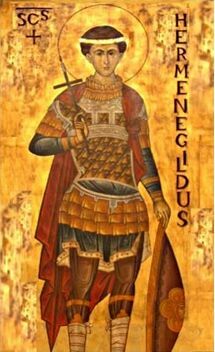 Saint Hermenegild was martyred in 585. When King Liuvigild died in 586-9, his remaining son, Reccared assumed the throne and Leander returned to his seat in Seville. In approximately 587-9, again due to the influence of Leander, King Reccared repented of the Arian heresy and converted to Orthodoxy as his older brother had done. 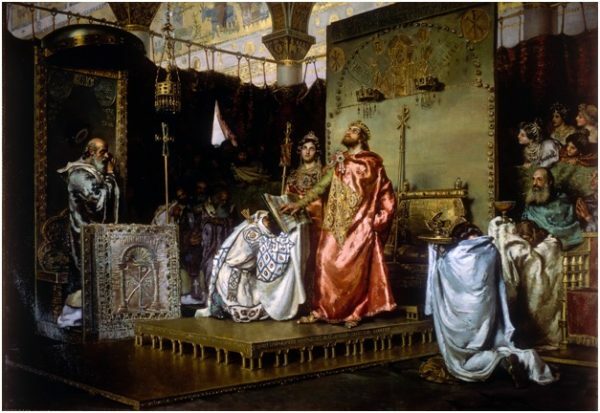 This was a turning point for the Iberian peninsula, as persecution ended and Hispania once again became a Christian kingdom. Leander spent the rest of his days as bishop of Seville fighting against the Arian heresy. Both Leander and Isidore were canonized as saints. Their younger brother, Fulgentius bishop of Écija, and their sister, the Abbess Florentina, would be canonized as saints as well. The story of this family demonstrates the importance of preaching the gospel. It was the tireless work of Saint Leander which converted royalty and in turn the leadership of a nation. It was the continuation of that work under Saint Isidore which saw the end of Arianism where it once ruled. 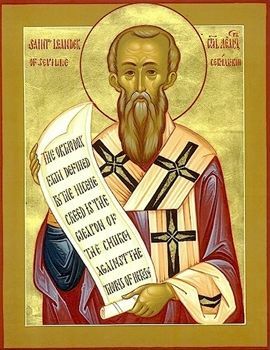 Furthermore, Saint Isidore defended the Church against other heresies such as monophysitism. As ecclesiastical leaders, the siblings of these saints, Fulgentius and Florentina, maintained the same Orthodox teaching. For this family, the Orthodox Christian faith was more important than life itself. It is the examples of these saints in their evangelistic efforts and their willingness to confront blatent heresy that we should emulate. May we remain firm in the Orthodox faith and never lose an opportunity to preach the gospel. Gregory the Dialogos, Dialogues Book 3 Chapter 31.